You can also use four slices of hand-cut cob or cottage loaf instead of the brioche. 1. Place the chocolate in a heatproof bowl over a saucepan of simmering water, ensuring the bowl doesn't touch the water. Stir until the chocolate has melted. Remove from the heat. 2. Spread two slices of brioche with the melted chocolate and sandwich together with the remaining slices. 3. Whisk the egg, cream, milk, caster sugar, vanilla and cinnamon with a fork in a shallow bowl. 4. Soak the sandwiches in the egg mixture for 30 seconds on each side. Meanwhile, melt the butter in a large non-stick frying pan over medium heat. When the butter is sizzling, remove the sandwiches from the egg mixture, allowing any excess to drip off, and place in the pan. Cook for 2 minutes on each side, or until well browned. 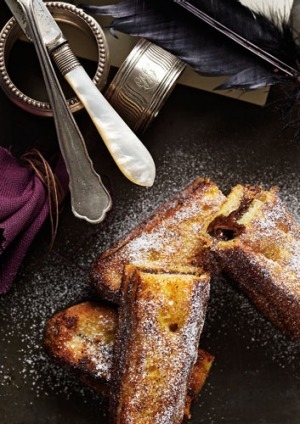 Cut the sandwiches in half and serve immediately dusted with the icing sugar.